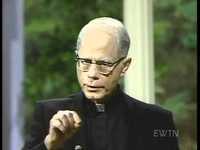 Father Thomas Dubay, S.M., was a well-known retreat master and expert in the spiritual life. A Marist Priest, Father took a Ph.D. from Catholic University of America and taught at major seminary level for about fifteen years. He spent the last three decades giving retreats and writing books (over twenty at last count) on various aspects of the spiritual life. He is an expert on the teachings and writings of the two mystical doctors of the Church, John of the Cross and Teresa of Avila.